I got an email that made me very wistful; I had hoped to see him one more time.Â I wrote about him here; Time Magazine interviewed him here.Â Goodbye, Uncle Richard; we miss you.Â My children remember your kindness.Â Rest in peace, and say hello to your brother and the grandparents for me. Remember this? Prove you’re married or we drop your wife from the health insurance, etc. We finally got the kid’s transcript in hand; deadlines are wonderful things. So. Off to his office to fax everything in. Reading the fine print after I got there that I should have paid attention to earlier, marriage and birth certificates in hand, I realized, wait–they want our tax return too?Â And, just in case we got divorced since last year, they want a bank statement or utility bill with both our names on it that’s not older than two months?Â But what if those don’t put both our names on them? Back home, growling at the lost time and the utter stupidity of it all.Â Growling at myself for forgetting to hit “save” on my *Turbo-taxes yesterday (the software later restored the files for me when I finally dared look at it)…Â Trying not to let it all get to me. The only reason I found what I needed is that, on a whim, yesterday I’d gone to City Hall to pay my utility bill in person as long as I was running an errand nearby.Â Meaning I hadn’t torn off the top of the bill, the part you mail in–and the only part that had both our names, the bank being of no help.Â Small favors that are everything in that moment; thank you, dear G_d. Back to the office.Â I was almost there, driving along–when suddenly I noticed it. Somehow I just simply hadn’t before.Â It was instantly clear to me what it was. I am not Jewish. But this is Passover week and Easter week, and those who’ve read my book know that our first day in our new house here, the day of the moving van, a day that was completely overwhelming with boxes erupting constantly from the truck while I tried to manage three kids ages four, two, and crawling, we were invited to come to a Seder as soon as that van left.Â Just because we were friends of friends and Nina knew what moving was like. We were the strangers at the gates.Â She and her husband warmly welcomed us in. That line overhead had never called attention to itself.Â It was just the simplest reminder on Earth that G_d is here, too.Â It brought me up short and completely turned my day around at a moment I greatly needed it. A piece of string. It healed my world in that moment.Â My thanks to those who put it there. Today was–well, tomorrow is a do-over. I’m looking forward to that.Â There were a lot of surprises piled onto one day that I could have done without, although, nothing that can’t be fixed (with a careful attention to old paperwork. )Â Just dumb stuff, really.Â Richard came home from work and I basically told him, Please give me a hug before I burst into tears. He did. He’s a peach. I finally took the time after dinner and made myself sit down with my knitting project.Â Yes, it takes a longer wait to see progress on 4mm needles than my usuals. Tough. Do it anyway. Actually, there’s more progress showing now than I’d expected–and it Stays. Done.Â With each row, I never have to knit it again: the thing is accomplished.Â My I-wishes became I-dids. That helped more than I thought it would. Twelve rows x 398 stitches so far this evening. 1. So…if you browse through some yarns at some of your favorite dyers on your PC for a few minutes, idling the needles to give your hands a needed break, is it then Windows shopping? 2. Michelle took a whiff at the lemons in the bowl to see if they’d gone off yet, and asked me about their ages?Â I’d picked them Sunday? Well then! Which is how we found ourselves eating the first lemon bars out of the oven before they’d even set yet, necessitating forks.Â Setting the bar high, temperature-wise. 3. The towhees didn’t fly off in a fright like they used to when the brash bully of the yard swooped in: I guess they’d gotten jay-ded by now.Â The bluejay ate a few sunflowers and then chased them just enough to show them who still thinks he’s boss, but clearly, they’re on to him: even if he presents a big bill at this fancy restaurant, he’s into fast food.Â Eat and run. 4. Those towhees got downy to business right after being left alone again, courting by quivering their wings and bopping around with their tails held high, and then the one that had to have been the male emphasizing his studliness by, Look at me!Â I’m a poofball! She was all, eh.Â Â Don’t bother me. So he gathered some tiny twigs in his beak for helping with the nest building. Last I saw them, they were bouncing together across the yard towards the trees. Back up a moment here.Â For years now I have had visual memory damage and a specific difficulty with recognizing faces of people I’ve only recently met or that I don’t often see. …And yet, “MICKEY!? !” burst loudly out of me before she’d even turned around. Sixteen years.Â It had been sixteen years. She was the young grandma with neon-(wait, I forget–was it purple? Fuschia?Â Blue?Â I think it varied.Â Punk-spiked and wild-colored, anyway) hair.Â Her grandkids were just slightly younger than my kids. Who did not have a California Cool-version grandma quite like my Norwegian-born friend Mickey. I adored her.Â Always will.Â And somehow my soul refused to let my memory damage defeat me or even slow me down, not for one instant, the moment I saw her today.Â I’m still trying to figure out how it could have been so (and her hair was normal now), but… ! Her daughter had moved to Washington State, and Mickey with her, in 1994. I did not get to see those children growing up with mine, and I have wished it could have been otherwise. She turned at hearing her name and took me in for a full two seconds before it hit her and, “OH!” as she threw her arms around me.Â She was too kind to say anything like, when did your hair go so gray? Where are all your little kids?Â How did you get so old?Â Where on earth did that cane come from? GOOD to have you HOME, Mickey!! Why had she come? I asked. Simply because it was time to see old friends.Â Just because. Okay, now, that is a thought to live by. Grab your plane tickets, let’s go. And in the meantime.Â While Richard was sitting waiting patiently for me by the main doors, he was being charmed by a young mom’s two-year-old daughter waiting with her mommy for her daddy to be ready to go, too.Â He described the scene later over dinner: if her mommy asked her a question, she had to jump up and down before she could start to answer with a giggle. Bouncy bouncy bounce. Every question. Every time.Â She was *so* cute. Michelle, intrigued, asked, And did she have blonde curls? Michelle: Oh, that’s just too perfect. Richard: Yes, it’s exactly how you used to bounce; you didn’t walk, you bounced, jumping up and down with each step. Michelle: And singing Little Mermaid! Me, laughing: Oh, boy did you sing Little Mermaid! Michelle went on to tell us a vivid memory of hers, long forgotten by either of us: her daddy was crossing the street with her to the Double Rainbow ice cream store downtown, a very special treat, one-on-one Daddy time to celebrate her birthday, when suddenly she realized: she hadn’t sung her song! She hadn’t bounced! She was so excited that she’d forgotten and she’d actually *walked*!Â THAT’S not how you do it! And to Richard’s horror, she’d darted back across that often-busy street so she could do the job right.Â Bouncy bounce, sing Little Mermaid.Â There you go. Did it right that time (and, I’m sure, with her daddy’s hand holding tightly to hers just in case this time). She remembers that sense of satisfaction in getting it right.Â Uh uh uhhh, uh uh uh-uhhhhhhhh. Put joy in the world! At any age. At any time.Â In any color.Â Curly, punk, blonde, blue. I want to see Mickey’s daughter and grandchildren; I say, the reunions have only just begun. And I hope to see my young-mom friend’s exuberant little daughter grow up here, so her mother and I can swap tales in some day to come over when we had cute little girls always jumping up and down for the sheer joy of being alive and well loved. Maybe I should go spike my hair. Sometimes ya just gotta do what you gotta do. Cast on! And like yesterday’s flowers, the white resists being photographed well.Â NO, don’t take my picture, can’t you see!Â I’m having a bad-stitch day! I wrote the above, went back to knit some more to try to come up with a brilliant blog post title, finished the yoke, got to the end of my 398-stitch row, and…found I can’t count to two.Â Repeatedly.Â It’s tinked and reknit and all better now, and I still say it was a good stitch day.Â Because sometimes nothing will do but plain and simple and something that is a treat to the hands, while looking forward to making someone else happy with it, too. I found it easier than last year, but still, the attention must be given its wandering time off from it all.Â I grabbed my camera.Â Not quite enough light but a little too much flash and then a dead battery but you get the idea. The Meyer lemon tree, walking across the yard from there, smelled heavenly, and I picked myself a few that were starting to go orange, spreading the intensity of that aroma into my hands, where it stayed for awhile.Â Â Scents and sensibility. The baby plum tree my children planted me is coming along and in leaf, way ahead of the apples, which are just starting to sprout a bit of green. Two squirrels were totally making out, squirrel style: tackling, wrestling, chasing, sneaking up, jumping sideways straight up high into the air, pouncing, biting, grabbing and pulling each other by the tail off the tree trunk (near to the ground, though), doing a total Calvin-and-Hobbes act of disappearing into a single rolling angry fighting animated-hamster-ball, and I thought they were fighting over territory because it definitely wasn’t gentle. C’mon, you guys, get a tree. Last night, I went to hit “publish” and my network was down for maintenance. A moment of insomnia later and I got up and finally hit that button, wondering whether I dared re-read and try to edit the thing with what my brain might come up with at nearly 4 am. Tonight, calling ISP tech support, it was, oh, sorry, that server should be back up in two hours. I’m crossing my fingers and trying just once before turning in. And did I mention my printer suddenly isn’t working so I wasn’t able to print out any of those designs I’ve spent all that time on the last two days? But in blog news today (assuming it’s still today when this goes up), actual knitting did finally commence anyway. At last! Some patterns are just not meant to be. Went back in the other room where it was drying for remeasuring–swatches lie, so you have to catch them at it and test them again and again. Out!Â (No, I’m not going to show it to you. Although, my enjoyment of a good laugh is sorely tempting me. )Â Nope nope nope.Â Sorry! An hors-d’ouvre.Â An amuse-bouche. Perhaps not so much for a main course, truth be told. There’s a lace pattern I’d never knit because it just… hmm…Â Some of those rows put together were, to my eye, like the time my daughter, working at a small makes-their-own shop one summer, handed me a sample of the locally famous Gilroy Festival-inspired garlic ice cream and said, Here: you have to try this at least once. It came out kind of the equivalent of Computer Chip ice cream at that Silicon Valley shop, chocolate oddball shapes in orange. Good–but it’s sure not basic vanilla to which you can add all kinds of toppings.Â But ooh, does it go well with chocolate sauce. It has enough character to stand alone. I’m scarfing it down. The local paper had a story Friday about Enoch Choi, a physician who wanted to help out in Haiti, who wanted to bring a medical team as well as himself there, but, he said, the major relief organizations wanted a month’s commitment and most doctors and nurses he knew just couldn’t take that much time off. So he worked out on his own a way to get rotating teams of his local colleagues in and out for a week each month.Â His church, Abundant Life Christian, helped with the logistics as he was setting things up; even the local schoolchildren helped with the fundraising. The baby near death of dehydration and pneumonia, who, given care, one doctor said, “It was like watching a flower bloom in time-lapse photography.” What was left unsaid was the unfathomable gift of being allowed to know they had saved a life–which, one by one, happened many times over. I love that.Â The ability to see the power in our stories helps make us whole, and the gift of that physician seeing the whole picture, and giving it to that mother, changed everything.Â Â For her and him both. The sum of their thoughts was, Haiti is a place of hope, and that hope will save them in the end. When I was a patient last year and very ill, I had a kind, calm doctor taking part in my care, the kind of man where you instinctively know you’re in good and caring hands and that, no matter how hard it is right now, you’re going to come out of this okay. And his name was Enoch Choi. I know not everyone agrees with me. But oh thank goodness. At last! Who on earth wants to be on the side of people like that? And then Nancy Pelosi.Â Whatever else you may think of her.Â Calmly and surely, taking her turn at the podium, talking about the actual issue at hand: what was in the bill, what it meant to Americans, and why it was an important piece of legislation that after all the work done on it and the ways that it would benefit the American people, deserved to be passed.Â The contrast! Well, now, actually, Mr. Boehner, sir, the American majority has voted. I really should have taken a picture of that thing set at an angle just so; I saw a squirrel trying out the oven-parts see-saw, testing, testing, one two, flee?Â Holding still unseen, I watched it scamper down and away–clearly that one had learned its lesson. But each of the others had to try for themselves, rack-ing up the flea-coat flier miles.Â Making quite a rack-et, too, I’m sure, if only I had better ears.Â When I set the thing back up a little too steady, one black squirrel actually made a successful leap from it onto the birdfeeder, but promptly got thwarted by its cage cover closing down. (Which is what it’s supposed to do, but doesn’t always. )Â Nuts! Meantime, back at the needles, I knew–but ignored–the first rule of knitterdynamics: don’t wear an outfit that clashes on a thermonuclear scale with the project you’re trying to finish.Â That shawl in bright orange/red/fuschia?Â Against a dull teal? Not so much.Â And I’d decided to do another lace repeat–and then, after last night’s blog post about short shawls, another, just to be very sure–so part of me has been wondering why this shawl isn’t finished yet. Uh, the teal?Â The extra length? Ya know? Or maybe the occasional diversion like these bird photos (the first is funny, the rest, simply stunning) via LynnM. The lack of chocolate.Â THAT’S it! Well. That, we can fix! Tomorrow I’ll finish the edging while the squirrels flip themselves off. She didn’t know she was modeling for me. I was out with friends tonight, and although it was warm at the time we took off carpooling across the Bay, I carried a sweater and a shawl in my knitting bag with me; it’s always cold at night here when the San Francisco fog rolls in. Several hours later, I caught one tall friend shivering, and being plenty warm myself with just my sweater, I surprised her from behind when she leaned over a moment (ie, I could reach!) and wrapped my Bluejay around her shoulders. She loved it.Â I told her I was afraid she couldn’t keep it, because it was one of my in-the-book projects, but she loved how soft it was; baby alpaca? Ooh, nice. I told her how that bluejay got its heathery effect, and she laughed. But I got to see one of my shorter shawls on one of my taller friends and mentally gauge the fit and length and how to adjust them to better fit more people. Always a good thing. She reinforced some ideas and did me a favor. And yes, she cheerfully gave it back at the end; I’m sure she had no idea it was with a pang on my part.Â But really, though, it was a tad short on her anyway. Another row or another blog post? Another row or… Trying to squeeze in both, but I almost didn’t put down the needles.Â Â Another lace pattern repeat or a cast off? Another repeat? Yes? Okay, then, can’t finish it tonight no matter how late I stay up. This knitting thing. It’s addictive! Mary had a little land(line), little land(line), little land(line), Mary had a little land(line) whose bleat was her ring tone. 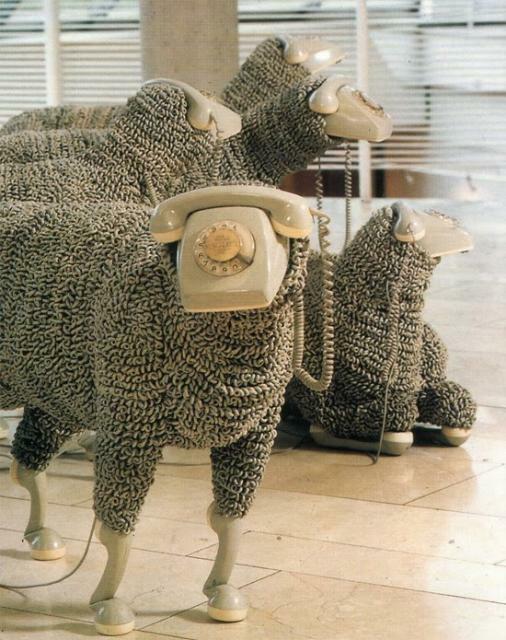 Actually, she had two.Â She named her lambs Handset and Get It before it stops ringing!, but they were eating her out of house and home phone. They were twins, not identical, but still, a dead ringer for each other, and they stayed close over the ears; Handset was her goat-too guy. Have you herd?Â That sheep got all hung up about the fact that someone didn’t do a number on its face.Â The press were flocking to the story.Â Some old guy, a Rotary member, went, ewe know, like, totally wireless on him.Â Sheepsh. You’d think the guy would be more cord-ial. By shear happy-stance I have a dial for you.Â Creatively Dyed is having a 50% off sale on milk yarn–actually, that’s true–but is it good with spinach and sweetened cranberries in a salad? How do you feta ’bout that? *definitions for Don: roving is wool that has been carded at the mill–they wanted to make sure it was old enough to get in. Top is roving that has been processed again to take all the short hairs out so the voices won’t sound scratchy over the lines. *If you send this in a telegram overseas using babelfish to try to make someone laugh–and I wouldn’t put it pasture–careful, it might come out a barbed wire offense.